Russian President Vladimir Putin warns of an “extremely dangerous” situation in Syria, continues to reject a military intervention. Russian President Vladimir Putin warned Friday of an “extremely dangerous” situation in Syria and emerging signs of a civil war, but continued to reject a military intervention. Amid mounting pressure for Moscow to drop its resistance to tougher UN action on Syria, Putin met with German Chancellor Angela Merkel and had arrived in Paris for talks with French President Francois Hollande. 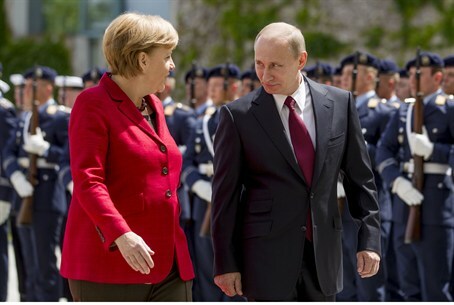 AFP reported that in Berlin, Putin appeared to strike a more conciliatory tone, warning of the escalating danger from the Syrian conflict and refraining from openly backing President Bashar al-Assad's regime. “As far as arms supplies are concerned, Russia does not supply the weapons that could be used in a civil conflict,” Putin told reporters. “We both made clear that we are pushing for a political solution, that the Annan plan can be a starting point but that everything must be done in the United Nations Security Council to implement this plan,” Merkel was quoted as having said. Putin said Moscow was not taking sides in the deadly strife rocking Syria, where the Britain-based Syrian Observatory for Human Rights says 13,000 people have been killed since Assad's regime launched a brutal crackdown on the opposition in March last year. Meanwhile on Friday, the UN Human Rights Council called for an investigation into the killing of more than 100 civilians in the Houla region of Syria, and condemned Syria for the massacre. The world's top human rights body, met on Friday in emergency session - the fourth time it has done so to discuss Syria since the uprising against President Bashar al-Assad began in March 2011. In the vote, 41 members voted in favor of the resolution condemning Syria, while Russia, China and Cuba voted against it. Two other countries abstained and one was absent. The resolution also specifies that there should be an “international, transparent, independent and prompt investigation” into the massacre. On Thursday, Syria blamed up to 800 rebel fighters for the massacre in Houla. The accusations starkly contradicted accounts of witnesses cited by UN investigators who blamed “shabiha”, the gunmen who operate on behalf of President Bashar Assad's regime, for the massacre in the Houla region.